Where dead leaves shilly-shally in the wind. Among the briar hedges and the hawthorn. And spring in a few flowers, blooming white. A robin hopped around the leafless branches. Above dead leaves and vanished: a few scurries. And picks his spot to launch his long-tailed comet. It rises to loud cheers from us kids below. Borne far away to flower again as windfall. And gazing face and heart of the kite-flier. Crosswind and a scream…Whose scream was that? 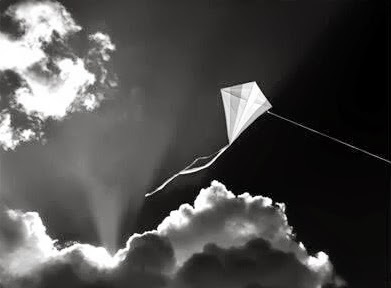 Only in the windfall of a kite. Raw from all that praying night and morning. The plaything that of all things was most dear. Where you sleep calmly, on your own, at rest. Combed it slowly so as not to hurt you.